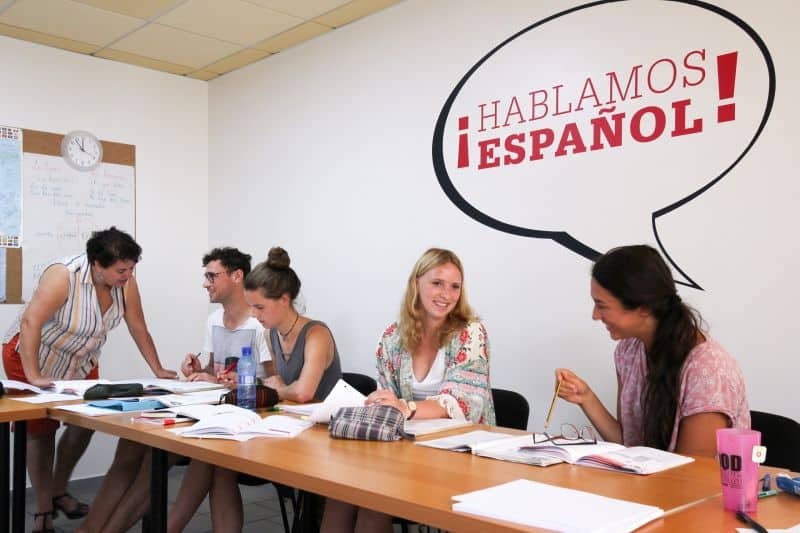 Why Should You Study Spanish at FU International Academy Tenerife? And we are very good at this. Every Friday I get the confirmation of just how good we are. We ask all students to fill out an online questionnaire so they can evaluate the quality of their experience at the Academy. I make a point of reviewing them all. With over 25 points we ask for marks from 1 – 5. If we get a review lower than “good” or “very good” – I discuss this with the person responsible. We have been implementing this review system since 2004 and have learned a lot from this feedback from clients. The result is that almost 100% of our clients are completely satisfied with the service we offer. 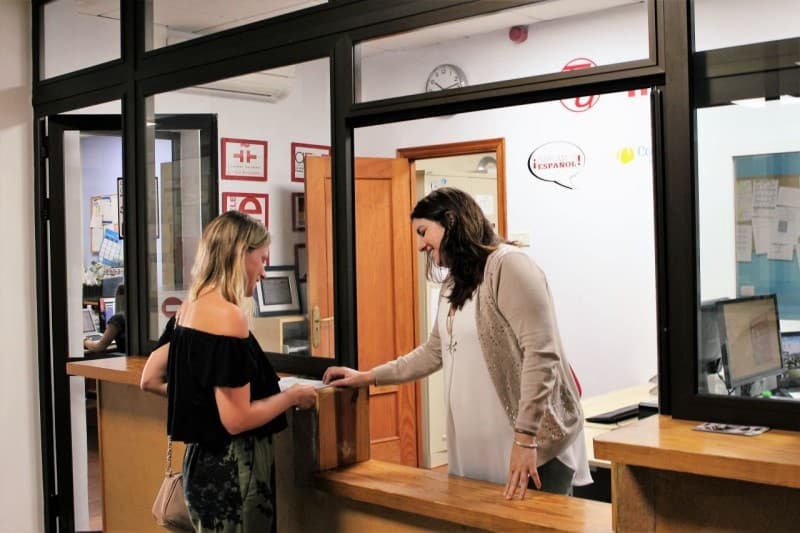 “In the beginning, my Spanish language level was at zero, but thanks to the solid organization and professionalism of my teacher, I was able to reach as far as level A1.4 during my stay! What makes us different from other Spanish schools? This is a typical question asked by every representative from language travel agencies at the Language School trade fair, ICEF in Berlin, which we attend regularly to promote the FU International Academy to agencies. And then I show them my phone with the current temperatures in Puerto de la Cruz and Costa Adeje. This always impresses. Especially in Berlin in November. 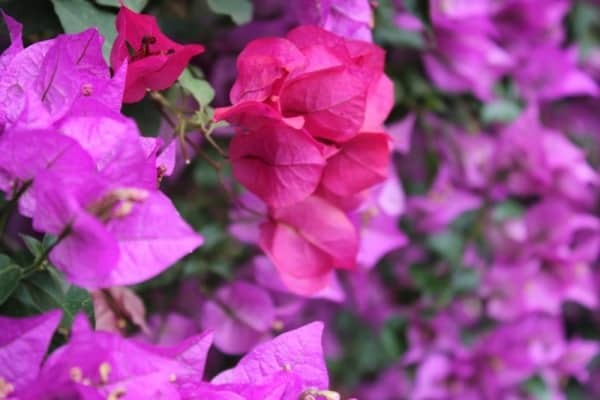 Tenerife is the one of most beautiful islands in the world and is known as “The land of eternal spring”. It is located off the west coast of Africa. 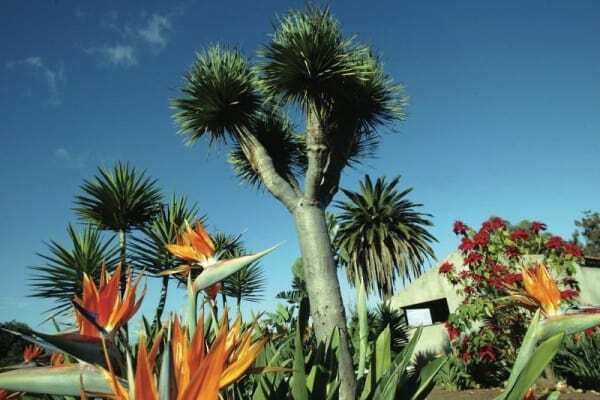 With an average annual temperature of 23 degrees celsius, it rarely gets colder than 18º C and almost never warmer than 30º C.
Tenerife is very diverse and has 5 microclimates. 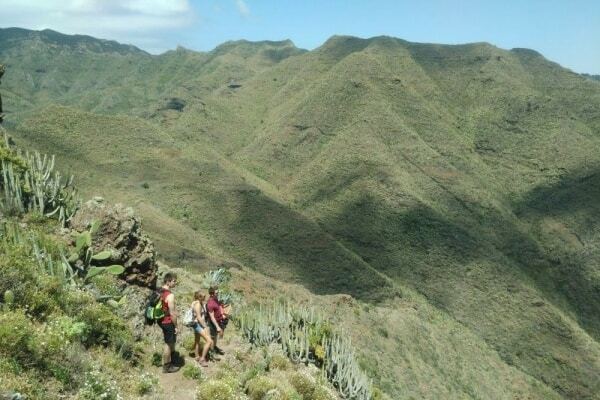 There are magnificent landscapes throughout the island and it is possible to participate in all kinds of leisure activities all year round. 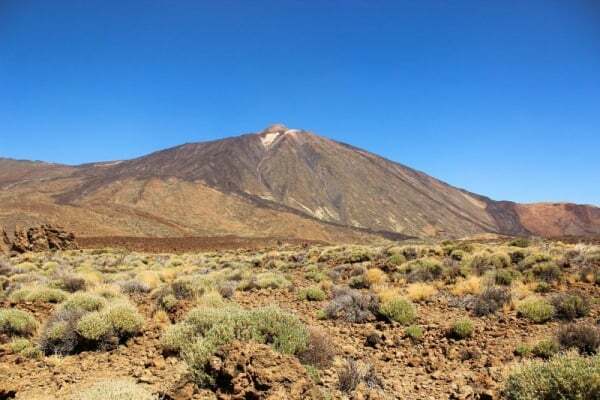 Mount Teide, at 3.718 m, is the highest mountain in Spain, and although it is often snow-capped in winter you can’t go skiing! Tenerife is roughly divided into the North and the South. 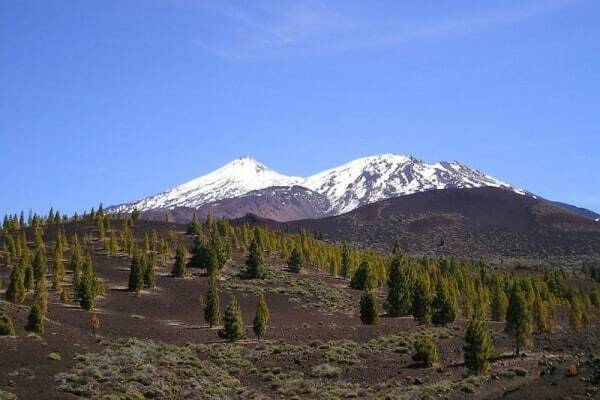 Mount Teide, with its foothills, separates the island and creates two different climate zones. The landscape in the North is uniquely beautiful. 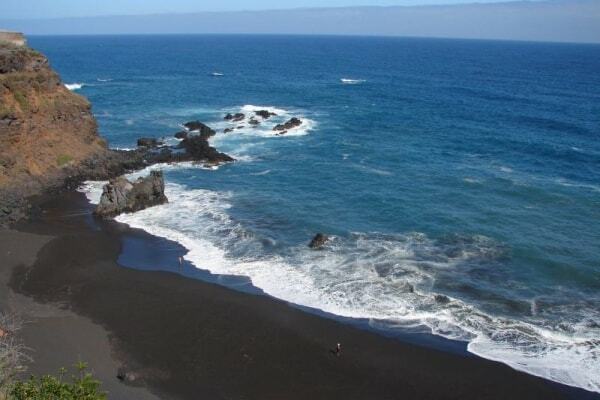 The beaches have black volcanic sand and are often located below steep cliffs. 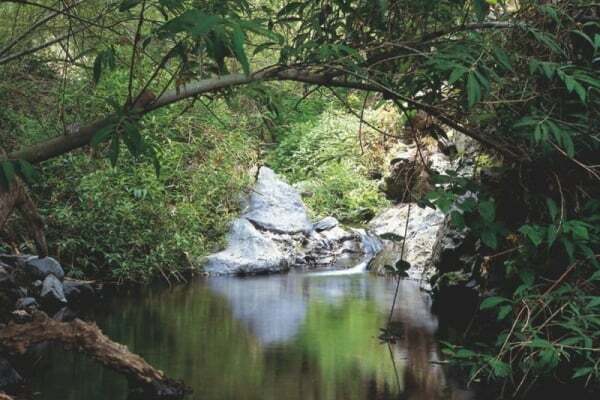 In this region everything is very green and fertile as winter showers refresh the landscape. The Orotava Valley can sometimes be cloudy compared to Costa Adeje in the South which is generally a few degrees warmer. Our school in the North is located in Puerto de la Cruz which retains its old world charm as a local fishing port. Here life has a gentle pace and tourism mingles harmoniously with everyday Spanish life. Around the main town square, La Plaza del Charco, there are numerous restaurants and bars and it is the focal point for the many traditional local fiestas. Also in the north is the lively university town of La Laguna. With its beautiful historical centre, it obtained UNESCO world cultural heritage status some years ago. 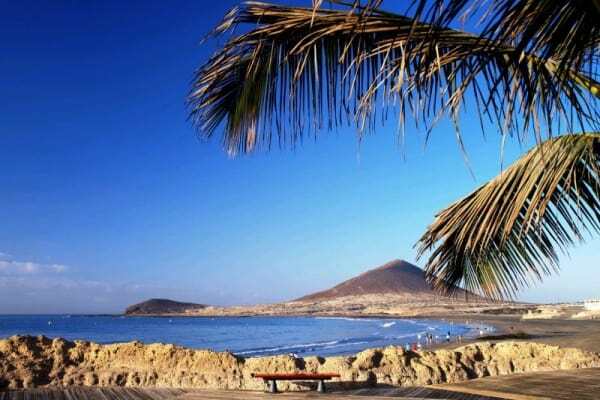 It is only 25 minutes by bus from Puerto de la Cruz..
Tourism is very important in the South. 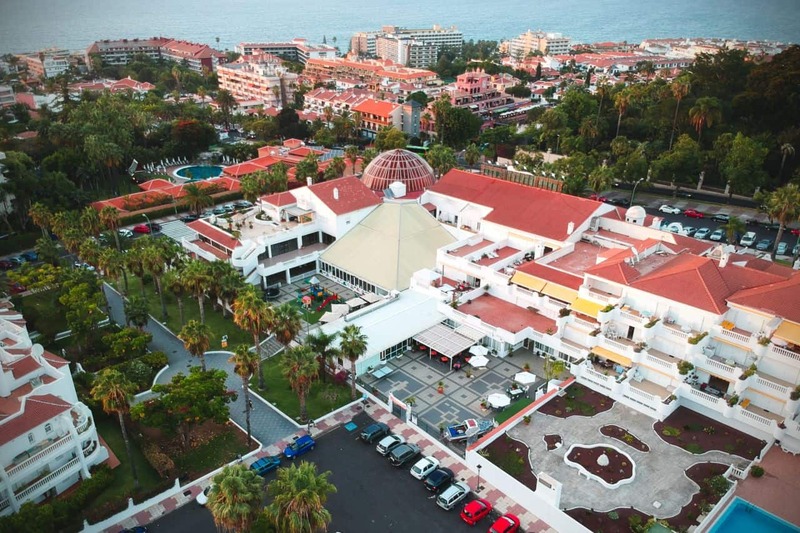 The main resorts are Los Cristianos, Las Américas y Costa Adeje where you can find kilometers of beaches, hotels, restaurants and shops all along the coast. 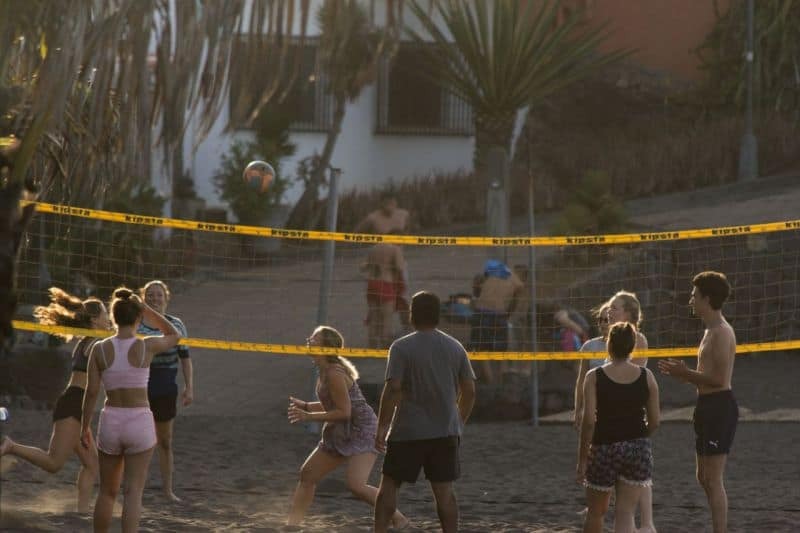 Costa Adeje is a paradise for tourists who love the sun. The infrastructure is new and everything is of the highest quality. Here you can find some of the best 5-star hotels in the world. And of course since the start of 2013 you can also find Tenerife’s favourite language school – the FU International Academy – ;-). 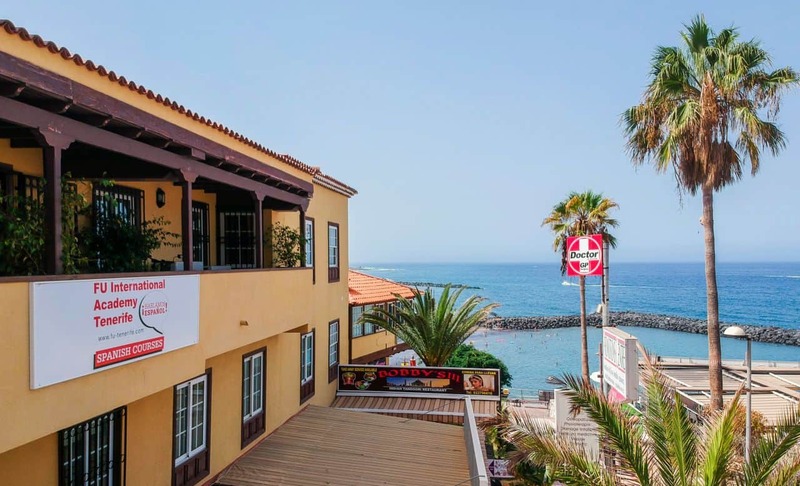 And of course there is the possibility of spending some of your Spanish learning holiday in Puerto de la Cruz in the North and the rest at our school in Costa Adeje in the South or vice versa. The courses, activities, accommodation options and prices are similar in both schools. On the one hand, we are small enough to call ourselves a family. A family whose student members change every week, but whose teachers, staff, and cafe members stay the same. Our family-run business is small enough to be able to invite all of our students to a welcome breakfast on the sunny terrace of our own FU café every week. There are rarely more than 6 students in one class at the same time and never more than 10. On the other hand we are big enough to offer every student the right class corresponding to the exact language level that they require. 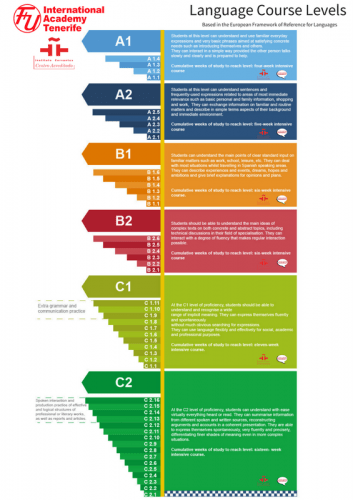 The classes are classified in accordance with the European Reference Framework from elementary A1, then A2, B1, B2, C1, to C2 (proficiency). Each level is subdivided into different sub-levels, for example: A1.1, A1.2, A1.3, A1.4, A1.5, then B1.1, etc. In our school, life never gets boring and no one need feel alone. We are open all year and our students come from all over the world, even over Christmas and New Year. After the lessons, we offer a variety of free leisure activities. 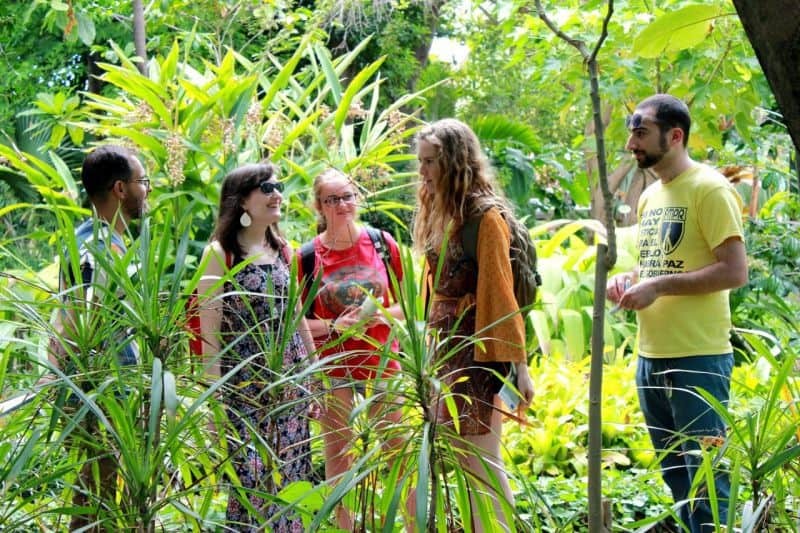 Salsa, Flamenco, beach volleyball or a visit to the Botanic Garden are some of our most popular options. The absolute highlight is the surf instruction course on Tuesday afternoons. With professional surf instructors you can try two hours for just €10. We are the only language school in Spain that offers this to its students! We can book hotels, organize any excursions you have interest in, print out boarding passes, help obtain visas, accompany our clients to the doctor, help them if they lose their keys and we even have a 24/7 emergency phone number. Why do we do this? That’s an easy one. – because we value our customers and always work hard to do our best to keep them happy and satisfied. We know this approach works as we have many returning students and others who extend their course once they are here. But are we, because of all these things, really all that different from other language schools? If you look look only the classes we offer, or the language that we teach, we certainly have similarities to other language schools. However, when you look at us as a whole and the massive array of experiences that we can offer to our students, that’s where we shine. And that’s what makes us unique. 307 queries in 2.933 seconds.